25. 3. 2019 Can you “catch” cancer? Billions worldwide are infected with tropical worms. Unsurprisingly, most of these people live in poor countries, kept poor by the effects of worm-related malnourishment. What may surprise many is that worms also cause the majority of cases of some cancers in these countries. Published in Frontiers in Medicine as a special article collection on parasite-associated malignancy , new research aims to inform prevention and treatment – and perhaps even turn worms against cancer. What does an ideal cancer service look like and how can countries/regions make that transformation? A European collaborative project  spent two years trying to answer this question. The solution they came up with is now being piloted in the Czech Republic, as Sophie Fessl from Cancerworld reports . Research shows that experiencing menopause before the age of 45 is associated with a higher risk of bladder cancer. This higher risk was notable if the woman is a smoker. The study, which looked at health outcomes of more than 220,000 US Nurses, is presented at the European Association of Urology congress in Barcelona. Lowering cancer incidence and mortality rates. Improving the quality of life of cancer patients. Making the best use of available resources for cancer diagnosis and treatment in the Czech Republic. Optimisation of availability of new diagnostic and treatment procedures. Fight against malignant tumours as part of both nationwide and regional political agenda. Making cancer prevention and comprehensive cancer care an interest of vital concern to lay and professional public. Putting emphasis on decreasing the influence of risk factors linked to cancer development. Ensuring early and effective diagnosis of malignant tumours. Ensuring that a high-quality cancer care is available for all patients, including the palliative care for patients with advanced stages of cancer. Continuous evaluation of results of the National Cancer Control Programme. Consolidating the position of Medical Oncology as an important and independent medical specialty in education, clinical practice and research. Strengthening the position of this field as the guarantor of good clinical practice in the treatment of cancer patients. International cooperation and harmonisation with the EU and the World Health Organisation (WHO). Enhancing the population awareness about cancer prevention, including the responsibility for one's own health. Supporting beneficial changes in diet and healthy lifestyle, including physical exercise. Supporting effective anti-smoking measures in compliance with WHO recommendations. Cooperating with the Czech Ministry of Health, the Czech Ministry of Education, Youth and Sports, medical faculties, health insurance companies, citizens' associations, non-governmental organisations and Czech media in order to implement educational programmes focusing on cancer-related issues. Ensuring a long-term support for running and evaluation of national screening programmes of breast cancer, cervical cancer and colorectal cancer, supporting the programme of personalised invitations to screening examinations. Improving the early detection of malignant tumours, particularly in cooperation with general practitioners. 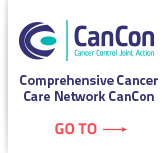 Supporting the network of Comprehensive Cancer Centres (CCCs), which has been accredited by the Czech Society for Oncology, the Czech Society for Radiation Oncology, Biology and Physics, the Czech Ministry of Health, and healthcare payers, and is based on four competencies: qualification, equipment, self-evaluation, and communication. Enforcing the equity, i.e. accessibility of the whole population to comparable cancer care and prevention information, cancer diagnosis and treatment; this must be done in cooperation with cancer care facilities beyond CCCs. Shortening waiting times for cancer-related care. Supporting a multidisciplinary approach in cancer diagnosis and treatment. Supporting the use of modern communication technologies in order to improve the population awareness of cancer as well as communication with the public; maintaining the high quality of contents at www.linkos.cz, the official website of the Czech Society for Oncology. Systematic and regular evaluation of availability of new therapeutic methods and cancer care results in comparison with other EU countries. Providing regular updates to healthcare payers and the public on challenges regarding the availability of cancer care. Standardising the follow-up procedures for persons at high risk of cancer, focusing particularly on the detection of secondary malignancies. Supporting the development of network of outpatient, inpatient and home facilities for palliative care. Integrating palliative care into both CCCs and cancer care facilities beyond CCCs. Supporting the continuation, stabilisation, modernisation, financing and practical use of the Czech National Cancer Registry in order to maintain an effective cancer prevention, diagnosis and treatment. Maintaining the high quality of contents at www.svod.cz, the website describing cancer epidemiology in the Czech Republic. Supporting basic and applied cancer research and innovations. Prof. Jiri Vorlicek, M.D., Ph.D.